In the tradition of Katherine Boo's Behind the Beautiful Forevers, an unforgettable exploration of the trials of daily life in Mozambique, long heralded as Africa's "rising star"
Over the past twenty-five years, Mozambique has charted a path of dizzying economic growth nearly as steep as China's, making it among the fastest-growing economies on the planet. But most Mozambicans have little to show for the long boom; to travel in Mozambique is to see much of the promise of development as a mirage. And in the fall of 2016, a debt crisis unraveled layers of corruption that reverberated across Europe, heralding what many in the financial world feared might be the beginning of a "global financial shockwave" (The Guardian). Go Tell the Crocodiles explores the efforts of ordinary people to provide for themselves where foreign aid, the formal economy, and the government have fallen short. 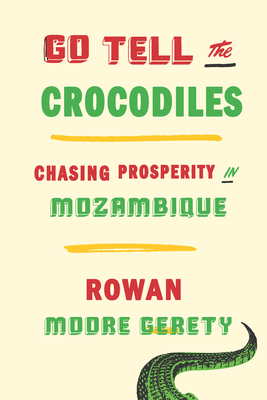 Author Rowan Moore Gerety tells the story of contemporary Mozambique through the heartbreaking and fascinating lives of real people, from a street kid who flouts Mozambique's child labor laws to make his living selling muffins, to a riverside community that has lost dozens of people to crocodile attacks. Moore Gerety introduces us to a nation still coming to grips with a long civil war and the legacy of colonialism even as it wrestles with the toll of infectious disease and a wave of refugees, weaving stories together into a stunning account of the challenges facing countries across Africa. Rowan Moore Gerety is a journalist based in Miami. His writing has appeared in The Atlantic, Foreign Policy, the Miami Herald, Slate, and Virginia Quarterly Review, and he has produced radio stories for NPR and PRI. He studied anthropology at Columbia University and was a Fulbright fellow in Mozambique. This is his first book.